Take cornbread to a whole new level with this Green Chile and Cheese Cornbread recipe. This recipe will make you crave cornbread as a side dish every time you whip up a batch of chili or soup. The creamed corn, green chilies and cheese combine perfectly to make the most moist and flavorful cornbread ever! I’ve been making variations of this cornbread recipe for years. 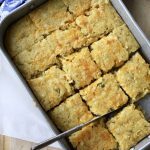 Sometimes called Mexican Cornbread or Cheesy Cornbread, our family loves this dish with soups and chili and as a side to enchiladas, beans and green salad. It takes hardly any time to mix up and is ready to eat after baking in just over 30 minutes. I love the simplicity of this one dish recipe. If you haven’t ever made cornbread from scratch, this is a great way to test the waters. Cornbread is really very easy to make and can be mixed up in one bowl, and baked in one pan. The buttermilk and creamed corn will insure your Green Chile and Cheese Cornbread is always moist. If you are opposed to green chiles, you can omit them, but I think you’ll love the flavor. This cornbread, served with a big pot of chili is a less than 30 minute meal, start to finish! Place the rack in center of oven and pre heat to 350 degrees. Beat the eggs in a large bowl. Add melted butter, buttermilk, creamed corn and green chiles. Mix until all ingredients are blended well. Add the flour, cornmeal, sugar, baking powder, baking soda, and salt. Fold the wet and dry ingredients together just until incorporated. Grease a 9x13 pan and pour the batter into the prepared pan. Sprinkle the top of the batter with grated cheese. Bake for 35-40 minutes until cornbread springs back when touched or a toothpick inserted int he center comes out with a few moist crumbs attached. I haven’t every reheated this bread, but Im guessing it will be fine! It is a moist cornbread, and if you undercook it just a bit (maybe by 5 minutes) it should be perfect! Thank you for your quick response! That is a great idea! You’re welcome! how did that work for you? Can I use self-rising cornmeal? Hi Ashley, self-rising cornmeal should work great with this recipe. Thanks for reading ABK!